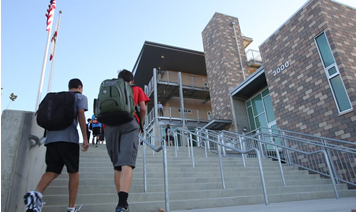 Encouraging our students to explore their passions, SCF sponsors the Genius Project. SCF offsets referee and umpire fees through SCHS Athletics Dinner events. Please help by donating now. Striving to cultivate an artistically literate community, SCF sponsors the annual ARTS Gala. 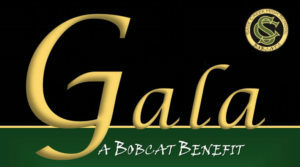 The annual fundraising event that benefits ALL students at SCHS. This event is held off campus and is an ADULT ONLY event. Photo booths, games, silent auction and live auction items are incorporated into the evening. 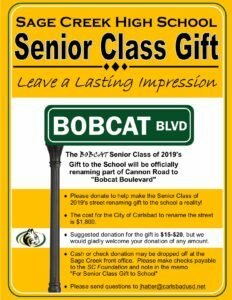 Annual donation campaign that provides opportunities for individual students and/or families to “leave a mark” on SCHS campus with an engraved paver on the front walkway of the SCHS campus. 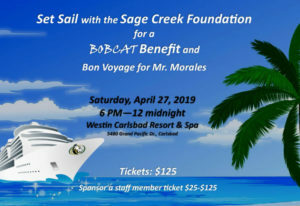 BOBCAT BENEFIT 2019 is here! CLICK ON THE LINK BELOW TO PURCHASE NOW!